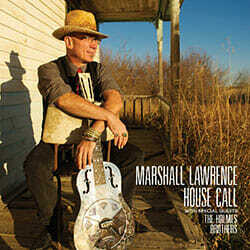 Alberta native Marshall Lawrence’s fourth album released on May 21, 2013 is a real gem. Called the “Doctor of the Blues” and Canada’s ” best acoustic slide and finger-style blues and roots artist”, Lawrence actually has a doctorate in psychology and uses music in his practice to connect with patients. Lawrence asked his dad for a guitar when he was 10 years old in 1996. By the time he was 14 he was doing live performances. Influenced by music greats like Chuck Berry, BB King, Johnny Winter and Eddie Hazel, Lawrence was drawn to acoustic guitar and mandolin. There are 11 original tracks on the album. Electric guitar is absent but not missed at all. Deft finger-picking and sweet harmonica blend with good story-telling for some toe-tappin’ blues. All tracks are under four minutes in length so the music and message doesn’t get lost in translation. My favorite tracks include the toe-tapping “Mean Momma Blues”, “Factory Closing Blues” which is a commentary about hard economic times relevant to current times and “Biscuit Rolling Daddy” with its great finger-picking.